Sixty miles off the coast of Africa lies the second largest of the Canary Islands, Fuerteventura. With mile after mile of warm, untouched sandy beaches tempered by a refreshing breeze off the Atlantic it has become a haven for beach lovers. Fuerteventura is located in the Atlantic Ocean just off the coast of north Africa, 50 nautical miles to the nearest point, although it is part of the EEC as it belongs to Spain. there are 152 beaches along its coastline - 50 kilometers of fine, white sand and 25 kilometers of black volcanic shingle. The elongated island has an area of 1,660 km² (100 km long and 31 km wide) and was declared a biosphere reserve by UNESCO in 2009. Most of the tourism is located in the areas of Corralejo, Caleta de Fuste and Jandia in the south, in between these areas are vast landscapes of scarcely inhabited open space. The island lies on the same latitude as Florida and Mexico and is surrounded by crystal clear turquoise water. The climate on Fuerteventura is pleasant throughout the year. The island is also often referred to as the island of eternal spring. We are are located in the municipality of La Oliva, located in the north of the island of Fuerteventura which covers an area of 356.13 km2 (21.5% of the island) including the Lobos Islet. 14.2% of the area is protected natural space and the municipality is one of the richest archaeological areas on the island. 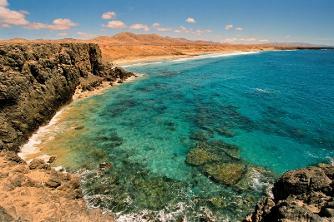 The natural park of Corralejo has a spectacular area of dunes and the village of Cotillo also has beautiful beaches. The sea and climate conditions make the municipality the perfect place for a variety of water sports. We would like to share with you our love of this beautiful island with its long white beaches, perfect year around climate and its tranquil lifestyle.